No, not this. This. My newest book and Valentine's Day present, Rappin' with Jesus, The Good News According to the Four Brothers. It all went down like this. A sister named Mary was to be married to a brother whose name was Joseph. It was Joseph, you see, who was a descendent of Abraham. It turned out that Mary was already pregnant, and Joseph wasn't happy about it--especially since the kid wasn't his. But Joseph was a pretty cool brother. Although he coulda dissed the sister big time and had her sent away, he decided that Mary was an all right sister (although she did have a big problem). For her sake, he decided that we wasn't gonna tell everybody her business. 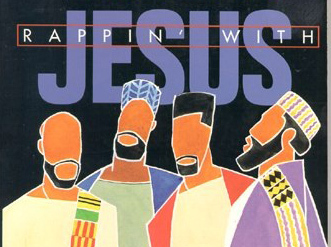 There's so much to love about Rappin' With Jesus. First, as a white guy currently living in possibly the whitest city in the third whitest state in the United States, just reading this text makes me feel about 32% cooler,* especially if I do it in the voice of Jules Winnfeld. Second, even though I've heard this story a thousand times, I am genuinely interested in reading what happens next. What is a cool brother like Joseph gonna do? So while he sat and thought about just how he would send Mary away without everybody knowing what was happenin', an angel of the Almighty stood before him. "Brother man, don't do this thing you're thinking. Believe me when I tell you, the kid Mary is carrying is a holy kid. Just like a brother named Isaiah said a long time ago, 'A virgin will get pregnant, though not by any brother, and when the kid is born His name shall be called Immanuel, which is the name if the Almighty Hisself!" And Joseph went, 'That's pretty hip.' Without another word, he married the sister, Mary, and when the kid was born they called the little brother Jesus"
Hip indeed. I imagine most of the kinds of people who read this blog would approve of Rappin' With Jesus, perhaps not as a liturgical or study text, but at least as an interesting lark. I have no idea how widely distributed the Rappin' is, but its stated objective is to introduce younger black readers to the Bible, which strikes me as a very worthwhile endeavor. Mormons have our own ways of teaching scriptures to kids, albeit in a decidedly...let's say, whiter, manner. But while it's nice to see Rappin With Jesus as a fun diversion, it reminds me of another important, if less amusing, issue: the language of scripture we use in church. Simply put, I'm not a big fan of the King James Bible or of its style of English. Reading any ancient document is challenging enough, and filtering it through a four hundred year old dialect adds an unnecessary and artificial layer of obscurity to the text. Our modern ears often mistake that obscurity for reverence, which we tend to project back onto the historical setting. That has the side effect of turning scriptures into stultifying, dull costume dramas instead of the lively, complex, and dramatic works they often are. That's not to say there aren't valid reasons for appreciating KJV language. A lot of people like how poetic and respectful it sounds, and they're probably right about that. Even if we accept that Jesus didn't go around speaking like a 17th century courtier, there's certainly value in ascribing a type of reverence to the past as a way of informing modern religious values. I'd argue that every religion uses and interprets the past that way. Unlike history or archaeology, religion isn't primarily concerned with trying to understand the past as it was, nor should it necessarily. Religion is concerned with how to act and behave today, and in that sense there's nothing wrong with using sacred texts to further those purposes, much like, say, the movie V for Vendetta reimagines Guy Fawkes as a hero of individual liberty and freedom even though the reality was a bit different. Not that I'd suggest using V as a sacred text...although if you did I'd probably visit your church... Anyway, there may be tension when religious and historical understandings are at odds, but from a religious perspective that's nothing new: it's the whole point of faith. Also, KJV English has informed so much modern church culture and doctrine that it would be nearly impossible to jettison it. Suppose we traded the KJV for a more modern translation, even a church-commissioned one: we'd be left with a text that reads radically differently than our other scriptures, none of which lend themselves to similar updating. The Book of Mormon and Pearl of Great Price, if you accept them as ancient texts, offer no available sources from which to retranslate, and I don't think church leaders would ever feel comfortable modernizing the language of the existing English. The Doctrine and Covenants, meanwhile presents itself as a kind of dictation from the Lord himself, and you don't make wholesale changes to that lightly. So for purely practical reasons we're stuck with the KJV. There was a brother who went down to Jericho and a bunch of bad dudes beat him up pretty bad. The brother was half dead. A preacher was coming down that same road and when he saw the brother lying half dead, he didn't want to become involved so he crossed over to the other side. The same thing happened when a Levite brother saw what had gone down. He looked and then crossed over to the other side 'cuz he didn't want to get involved But a Samaritan brother came to the scene, he looked and saw that the brother needed his help and gave it to him. He want all out, including taking him to a hotel to rest. He laid some cash on the hotel manager, telling him that if any more money was needed it wouldn't be a problem. "Now, sir, which brother was the neighbor to the fallen brother?" "Yeah, you're right. Now do the same." *I am taking for granted that blackness is synonymous with coolness, which, as far as stereotypes go, is probably okay.